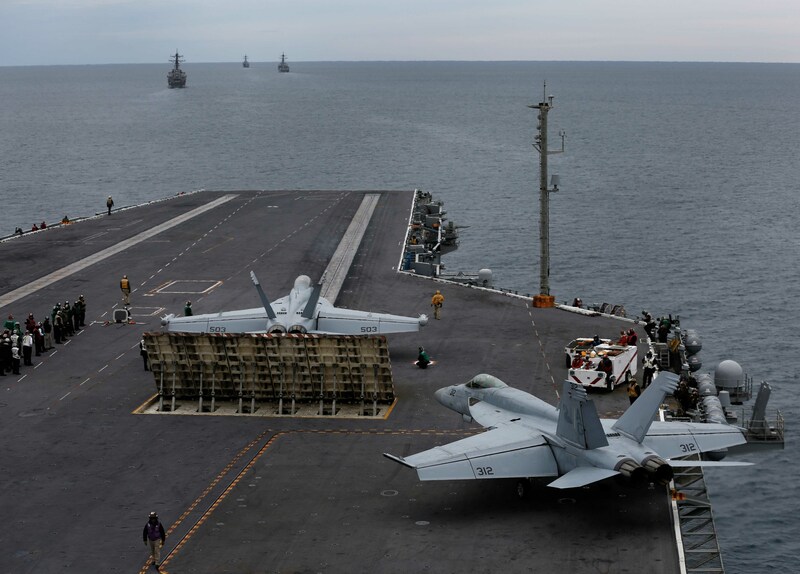 ABOARD USS ABRAHAM LINCOLN, IN THE VIRGINIA CAPES OPERATING AREA – The Abraham Lincoln Carrier Strike Group is underway for pre-deployment training after reaping the benefits of several high-end training opportunities in the last several months. 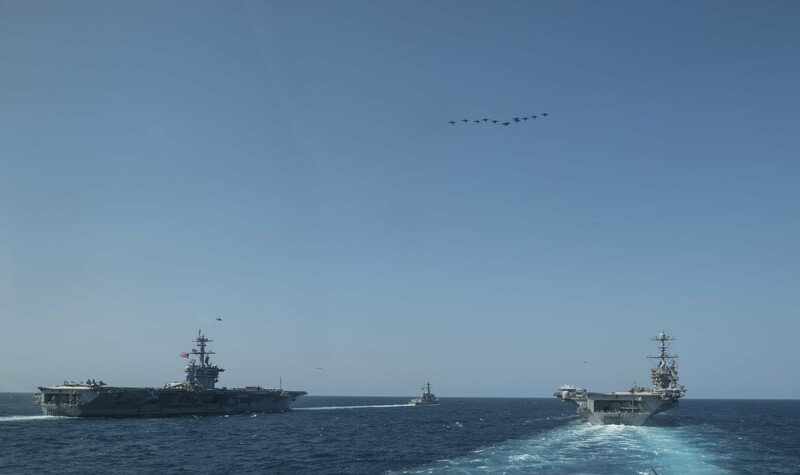 The Lincoln Strike Group has already seen more sophisticated operations than most going into its month-long Composite Training Unit Exercise (COMPTUEX), thanks to the ABE CSG combining with the Harry S. Truman CSG to form a carrier strike force for high-end training last summer. And with the addition of live, virtual and constructive (LVC) training leading up to and during COMPTUEX, strike group leadership is confident the ships and air wing will be ready to tackle anything the deployment throws at them. “We live in a dangerous, rapidly changing and complex world, and so our nation expects our Navy to be ready. 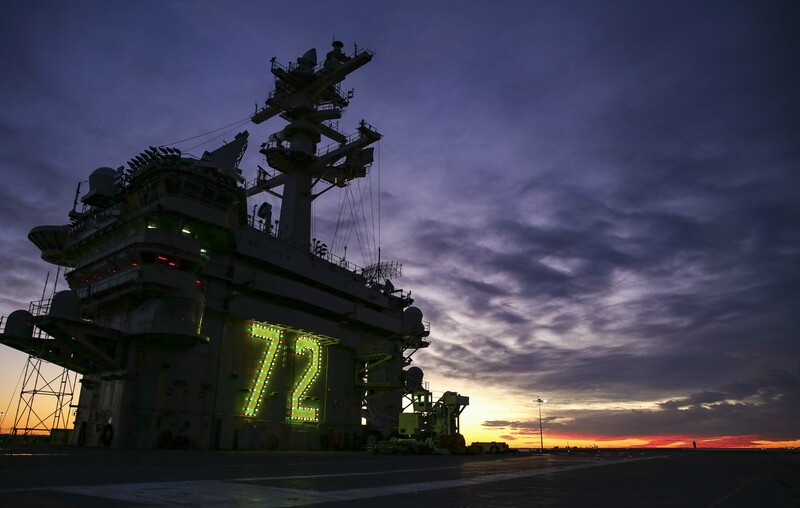 In order to be ready, we’ve got to practice, and we need to work hard and we need to train hard,” Rear Adm. John Wade, commander of Carrier Strike Group 12 and the Abraham Lincoln Carrier Strike Group, told reporters Monday aboard USS Abraham Lincoln (CVN-72). Leaders throughout the strike group say that COMPTUEX today represents a significant leap in sophistication and difficulty over previous COMPTUEXs – in part due to the increased use of LVC training tools. Lincoln Commanding Officer Capt. Putnam Browne told reporters that Carrier Strike Group 4, which oversees training and certification of deploying strike groups, can now set up scenarios at sea against virtual adversaries that the carrier sees in its combat system but are not actually in the water. CSG-4 can also virtually enhance a live ship, airplane or submarine – so that a live U.S. Navy ship can be in the water coming towards Lincoln, for example, but the effects they produce can be simulated to better represent an adversary’s ship, he said, forcing the carrier to defend itself against something that resembles a real-world threat. The Nimitz-class aircraft carrier USS Abraham Lincoln (CVN 72) departs Naval Station Norfolk, Jan. 25, 2019. US Navy photo. Capt. Bill Reed, Carrier Air Wing 7 commander, added during the interview that the COMPTUEX would weave together a “very robust adversary force” that included several U.S. Navy aviation squadrons, several ships, and some U.S. Air Force units, in addition to virtual adversaries being simulated in the waters. “We will get the high-end adversary and we will get that high-end training both virtually as well as in reality,” he said. Ahead of this new and more challenging type of COMPTUEX, various parts of the Lincoln Strike Group have had unique opportunities to gain at-sea and high-end training to boost proficiency going into this pre-deployment training event. Lincoln and Carrier Air Wing 7 had a chance to conduct high-paced operations at sea in August, when the F-35C Joint Strike Fighter was brought onboard and incorporated into cyclical air wing operations. The entire strike group came together for carrier strike force operations alongside the Harry S. Truman CSG in late August and September, which “allowed us to do different tactics that you can’t do when you’re just operating by yourself,” Wade said. Then the strike group’s surface combatants had their own crack at high-end operations during the first-ever Surface Warfare Advanced Tactical Training (SWATT) to be held on the East Coast for cruisers and destroyers. “What that allowed us to do was to bridge the basic phase, where it’s unit and individual training, into this exercise, which is the integrated phase. So it allowed us to operate together earlier. … It gave us the ability to ensure our communications were working, to flex our sensors and weapons, to give us more confidence in the material condition but also the tactics that we’re going to use here for this exercise,” Wade told USNI News. Before taking command of the Lincoln Strike Group last year, Wade commanded the Naval Surface and Mine Warfighting Development Center, which conducts the SWATT training events. 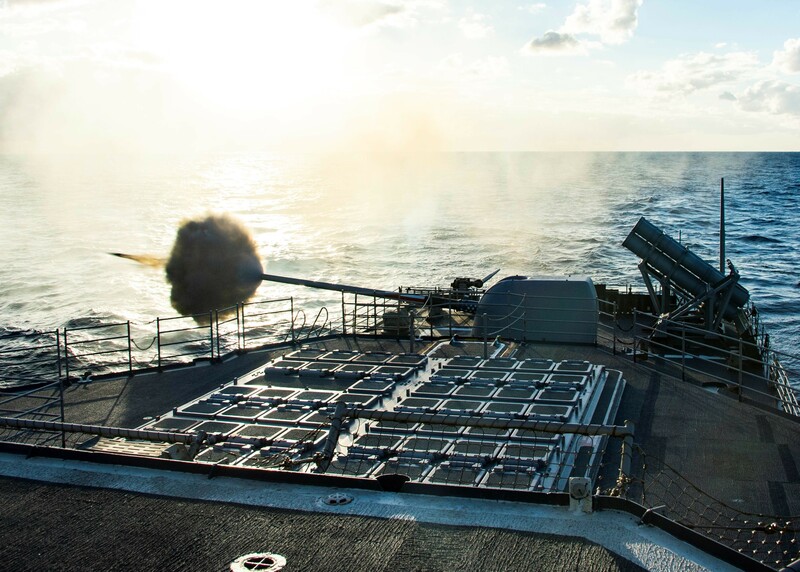 The guided-missile cruiser USS Leyte Gulf (CG 55) fires its forward MK-45 5-inch gun during a pre-action calibration fire evolution on Nov. 4, 2018. USS Abraham Lincoln (CVN 72) Carrier Strike Group (CSG) cruiser-destroyer (CRUDES) units are completing the first East Coast CRUDES Surface Warfare Advanced Tactical Training (SWATT) exercise. US Navy photo. He praised the addition of SWATT, saying that classroom training for the surface ships is a fine start to the pre-deployment process, “but to go out and put hands on the equipment and actually use it underway at sea is the most valuable training that they’re going to receive” to prepare sailors to come together with the rest of the strike group in COMPTUEX. “The more we can train and the harder we can train, then we’re more ready for the contingencies that could come our way. And also it makes us more proficient in just presence operations and providing stability and security throughout the world,” Wade said of the more sophisticated training his strike group has had access to this deployment cycle. Under Dynamic Force Employment, the Navy is pushing the idea that its deployed ships will not operate as predictably as they have in past years, and could end up conducting any type of mission in any location. Under DFE, USS Harry S. Truman (CVN-75) skipped the Persian Gulf altogether and conducted only a brief period of airstrikes on Syria from the Mediterranean – opting instead to focus its time on operations in Europe, including in the Arctic. “Senior leaders have been very very clear that they expect our Navy to be more lethal and more tactically proficient. And we need to be that because we live in a competitive environment where our security interests – not only of the United States but those of our allies – are being challenged across the globe. So the exercise really has evolved to really challenge us in every different domain – not just power projection (against land targets in the Middle East), like you just referenced, but that we can operate in the open ocean, anywhere around the world and in any type of mission set. And that’s why I’m excited, because it’s challenging us to be good in all those different areas,” Wade said of the hand-in-hand adoption of Dynamic Force Employment and the increasing difficulty of COMPTUEX. The Nimitz-class aircraft carriers USS Abraham Lincoln (CVN 72), left, and USS Harry S. Truman (CVN 75), right, and the guided-missile destroyer USS Mason (DDG 87), center, transit the Atlantic Ocean in formation as aircraft fly in formation overhead as part of a photo exercise in support of dual-carrier sustainment and qualification on Aug. 30, 2018. US Navy photo. The high-end focus of COMPTUEX is not the only notable feature of the Lincoln Carrier Strike Group’s predeployment workups. This will be Abraham Lincoln’s first deployment in about seven years, after undergoing a mid-life Refueling and Complex Overhaul from March 2013 to May 2017. The COMPTUEX is the first pre-deployment workup conducted under the command of the new U.S. 2nd Fleet. And the strike group will be the first to deploy with an information warfare commander, an advisor to the strike group commander on par with the traditional air defense commander and sea combat commander. Additionally, the carrier is also making preparations for a homeport change. 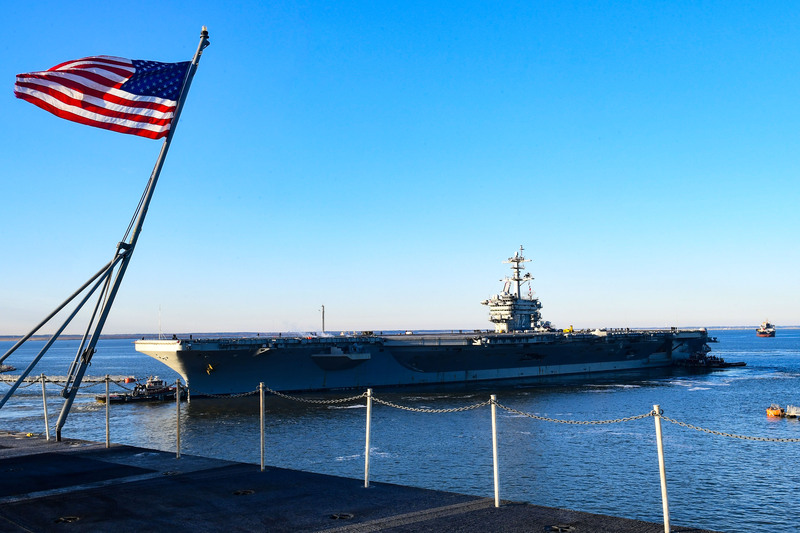 Once the ship departs Norfolk, Va., this spring, it will conduct a normal deployment through U.S. 6th Fleet and U.S. 5th Fleet but then transit through the Pacific and return to San Diego, where Lincoln will then be homeported. Browne, the Lincoln commanding officer, said this homeport shift is modeled after what USS Theodore Roosevelt (CVN-71) did following its own RCOH, which the Navy found to be a successful model.